Tortoise & Hare is a minigame in WarioWare: Smooth Moves, unlocked by beating Orbulon's The Secret of the Balance Stone stage. It is an extended version of the Hare Raising microgame. The game is played using the and the to wave two flags: a red one and a white one. A hare in the back of stage asks the player to raise or lower a flag, saying things such as "Red! Up!" and "White! Down!". It can also trick the player with things like "Red! Not down!". 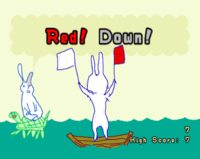 After some time, a gray hare appears in the background and distractingly waves its flags randomly during the game. Raise and lower the red and white flags. You've got to stay on your toes if you want to defeat that evil bunny! Play by connecting the Balance Stone. 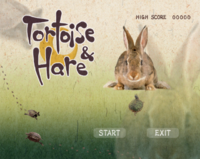 The title of this minigame is a pun on the fable, The Tortoise and the Hare. This page was last edited on April 5, 2018, at 12:21.